"If I'm asked now about one coach with whom I want to work again, I would say Mourinho"
In a candid interview with Belgian newspaper HLN, Hazard has explained how Mourinho's second spell as Chelsea manager descended into a "negative cycle" in his third season that saw him criticising players and taking the "fun" out of training. But Hazard admitted guilt for what he described as his worst season in football, which saw Mourinho sacked midway through the 2015-16 campaign - months after winning the Premier League. "In 12 years I've only had one bad season, the last six months under Mourinho, and it was partly my own fault," he said. "After the title, we asked Mourinho for extra holidays. I came back totally out of shape." He added: "The last season under Mourinho was not enjoyable. We didn't win, we got into a sort of routine, training without having fun, it was better for all parties that we parted ways. But if I'm asked now about one coach with whom I want to work again, I would say Mourinho. "I don't regret many things in my career, but that I have not been able to work with Mourinho at Chelsea anymore is one of them. We had a team that could win more trophies. We just ended up in a negative cycle. Mourinho's position as Manchester United manager has come under scrutiny following their worst start to a Premier League season in what is his third year at the club, though the board continue to back him publicly. His relationship with Paul Pogba has also appeared strained, having stripped the player of the vice-captaincy and been involved in a frosty exchange on the training ground - captured by Sky Sports News' cameras. Pogba had urged Mourinho to adopt a more attacking approach at Old Trafford. 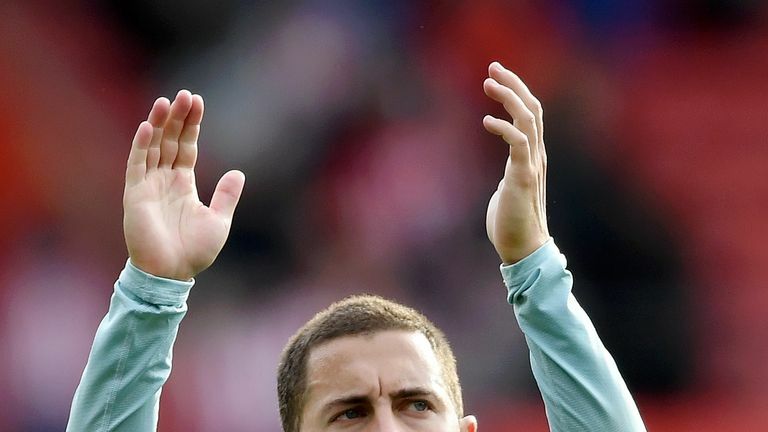 VOTE: Is Hazard currently world's best? But Hazard, who is enjoying life under Chelsea boss Maurizio Sarri and has eight goals in 10 matches this season, has come to the defence of Mourinho's playing style. "Mourinho's image of an extremely defensive coach isn't completely right," Hazard said. "He is far from adventurous like Pep Guardiola, but the season in which we became champions, we have made many goals and played good games."